Nonliterary Influence: Red Strange (aka Kid Red), a mentally ill tramp and derelict friend of Bukowski who wandered the highways and byways of America. 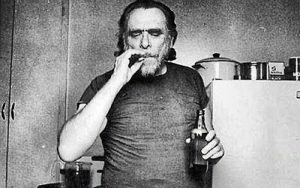 Bukowski often plied Red with beer and encouraged him to relate his wildest stories, many of which ended up in Bukowski’s own poems and short stories. Still worth at least one viewing. Barfly (1987) – Director: Barbet Schroeder. Starring: Mickey Rourke, Faye Dunaway, Alice Krige, Jack “Eraserhead” Nance, J.C. Quinn, Frank Stallone. Bukowski wrote the screenplay for this cult classic based on his early experiences in skid row. He even appears in a cameo as one of the barflies. Love is a Dog from Hell (1987 – Belgium) – Director: Dominique Deruddere. Starring: Geert Hunaerts, Josse De Pauw. Adapted from Bukowski short stories, mainly “The Copulating Mermaid of Venice, California.” Bukowski considered it the most faithful adaptation of his work. Also known as Crazy Love. Walls in the City (1995) – Director: Jim Sikora. Starring: David Yow, Michael James, Tony Fitzpatrick, Paula Killen, Bill Cusack. Three short films based on Bukowski short stories about assorted barflies.